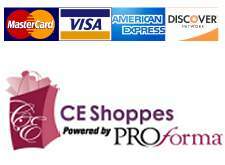 On-line: Once you decide on a product you can select the "Buy" button and you will be taken to our CEShoppes® on-line shopping cart. Please make sure to add any additional notes about your order at the check out screen. Include event date, color selections, gift cards etc.